I am happy with the results because it falls within my desired envelope for towing with a 4 cylinder TV and I doubt I can bring the total down much without major concessions. Using keyboard shortcuts saves me a lot of time and makes 3D modeling much quicker. I wish you and yours all the best. Hope to see more of your creative thinking. Thanks for the kind words and the tip on Sketchup. The reason I wanted a CAD that does moving parts is to help in dealing with an issure I call "lock down", a situation in which the trailer can be in either of two configurations (open or closed state) but can not move from one to the other because some parts limit movement before the other state can be reached. I call it lock down because I first encountered it with a design in which you could not lift the upper portion because as you lifted the back end, another part of the top needed to first rotate slightly downward (before reversing and raising upward). This is only a problem with multiple pivot designs. One fix was to accommodate the small downward movement with cutouts in the base, and I recall writing a program which displayed all the moving links for various degrees of opening. I also recall there was a freeware program for doing stick figure cartoon characters with multiple pivots which calculated and drew the new locations of connected links as you move one of the joints, but I never got around to investigating it much. Right now I'm busy with other things, but I'll try to see if I can draw up a stick figure to illustrate the problem. I'll also give Sketchup a try after looking over your tutorial links. Thanks for the tip! Edit 6/13/2018: I did put together an animated gif to illustrate this over a year ago, but it would not animate when uploaded to my album. The second try (months later) had the same problem. My 3rd try (tonight with a less complex gif as a test) suffered the same fate. I plan to add it here as soon as I can resolve why the post does not animate. Last edited by WizardOfOdds on Wed Jun 13, 2018 10:30 pm, edited 1 time in total. As this will essential be two open “halves”, only attached by a piano hinge at the back and lock down clamps at the front (when traveling); will foam give enough rigidity to keep it from flexing, or do you think I’d need a stick frame (say 2x2) with XPS? 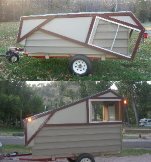 Yes, it is true that a opened pop up does not have the rigidity of the classic tear drop or even that of a simple fixed box trailer, even though the two halves are latched together. This is especially true with a telescoping top because (unlike the base), the top can not have cross corner reinforcement (it has to nest over the bottom). However, my chief concern in designing the Tip Top Tier Drop was always the stability of the top during erection before it is latched to the bottom. Diagonal flexing was my major worry because the top had to be manually raised (by an elderly weakling with no assistance) and that meant holding it in the raised position with one hand while latching with the other. Finding the right balance between stability (rigidity), cost and weight was my aim and that drove me to experimenting with very marginal construction to see what I could achieve. Manual lifting also put a limit on open height since I had to be able to reach a height clearing the latches. I knew this would be problem with camp sites that “rolled off” in the back, but what I under estimated was how often that would be the case. In fact, many camp site pads have a log back stop (which often ends up under the rear of the trailer) and a steep drop-off beyond it, creating quite a step down off the back of the trailer. We keep a stool handy for such situations, but sometimes that stool is needed just to raise the top. Your diagrams show the reverse, the top is hinged at the rear, which has an obvious advantage in such a case. Also, your flip-up end and side walls should reduce lift weight, but there are set up exposure advantages with telescoping designs. In any case, I find clam shell designs well matched to manual erection constraints. Along the same line, is keeping the top under control. With a clam shell, one end of the top (front end for mine) is securely anchored at all times. Although I have latches to keep the roof in place while camping or driving, during erection and folding I need to control the loose (rear) end. One worry I have, which may be of limited concern to younger/stronger/taller builders, is this: Any top light enough for me to raise (and hold up with one hand while raising the end panel with the other) is light enough to be a problem with wind gusts. From my perspective, the box trailer is less stable and less resistant to wind/rain during erection and folding, in part because there are just more steps that take longer to complete. Since 2011, I never had even a scare..... until this year when a very sudden storm hit while I was preparing to depart an open site over looking a large lake. I got things closed OK but I was concerned that the gusts might overpower me. Is it unreasonable to fear that wet folded panels might drip dry onto bedding? My Tip Top Tier Drop has one folding panel (in the rear) which comes close to overhanging the bed (unless I fold the bed forward) but I have had no drip dry problems so far. Along the same concern, I try to avoid any roof seams/joints/hinges over the bed to avoid leak problems. I'm thinking about building a foamie very much like the TTTD. Raising and lowering the lid looked like a problem, especially trying to do that while putting in supports and whatnot. I came across this solution -- 12V linear actuators. Amazon carries them for around $200 a pair depending on length from WindyNation. They are kind of slow at .4 in/sec, but that is still less than one min up to down (and vice versa) for all but the longest one (30 in). Placed reasonably close to the hinge you don't need all that much travel and they can lift 225 lbs each -- a pair of them, one on each side for balance -- would be far more than sufficient and they stay locked wherever they are when power is removed. I'm not a salesman for them -- really! -- but they sound almost ideal. Has anyone considered these, or am I missing something obvious? I have a flat back lifting hatch that we keep up to stand under. It is a nice place to change clothes with curtains around it. I was worried about the hatch over lifting in wind and wanted a convenient way to lock it in the up position. I found broken pop-up canopies in the dumpster at many campgrounds. The locking two piece legs are perfect for this. Just cut to size, attach to top and floor, and the button locks the hatch strongly in position. I hope this gives an idea.